You receive concierge-style service every step of the way. Use our website or call us to book tee times only or a golf package with lodging at multiple courses months before play. There is no extra fee for our service, and our advice and insider tips on over 350 golf courses around the US are unbiased. Confirmations, payments, changes, and whatever comes up, we make it easy, even for large groups. For larger groups, our group leaders will receive 50% for groups between 16-23 players and for groups 24 or larger, your group leader travels for free! Holds your trip until a month before travel. There is never a change fee, rainouts are reimbursed and we have great deals on same-day replays. We're not just a "dot com"! Behind our technology stands a caring staff of golf vacation experts who are just a phone call away throughout your quoting, booking and travel experience. Benefit from our 25-year track record and the knowledge we've gained booking over 100,000 tee times and 20,000 hotel nights per year. Because we’re one of the country’s trusted leaders in golf vacations, we have access to the best deals and those "hard-to-get" tee times, even on some private clubs. We offer custom golf vacations and packages wherever you want to play, whether it be Florida, Arizona, Myrtle Beach, Sea Island, Kiawah, Pebble Beach and many other locations. Hard to believe, but in 1991 none of us used the Internet and golf courses wrote their tee time bookings with a pad and pencil. That’s the year Thomas and Roseanne Stocker founded Tee Times USA with the vision of creating a company to arrange tee times and give unbiased advice about which golf courses to play in Florida. At the time, this was a revolutionary idea -- especially in Tampa Bay, where the couple lived and started visiting golf courses to convince them to allow advanced bookings on their tee sheets. Fast forward to 2016 and 25 years later, Tee Times USA is one of the largest golf package tour operators worldwide. Known as "Your Golf Vacation Specialist", Tee Times USA annually books approximately 100,000 golf rounds and 20,000 room nights. Our presence is now in all major golf markets across the USA. We continue to be Florida’s respected leader in golf vacation planning and tee-time booking services. After many years of exclusively offering custom golf vacations and tee times to Florida bound golfers, Tee Times USA now offers custom golf vacations to Arizona, Las Vegas, Hilton Head, Myrtle Beach, Sea Island, Kiawah and Pebble Beach, as well as other exciting golfing destinations. Karola Schorner, our Director of Operations for over 24 years, oversees our dedicated staff of 20 experienced golf vacation specialists who have booked millions of golf rounds in Florida and elsewhere for hundreds of thousands of golfers. In 2013, Tee Times USA was acquired by Adam Wachter and Marc Bender, two experienced entrepreneurial businessmen and long-standing passionate golfers. Both Adam and Marc have played competitive amateur tournaments throughout their golfing careers as well as having played hundreds of golf courses throughout the US. Their passion for golf and travel, merged with the excellent cultural fit with both the Stocker's and staff at Tee Times USA made the transition seamless. Tee Times USA operates today with a simple mission for every customer we serve, "let us plan your best golf vacation ever". Our commitment to customer service, where no detail is too small to be overlooked, is exactly as it has always been since Thomas and Roseanne founded the company, with the owners working side-by-side with their staff. We encourage you to read our "customer testimonials" which are updated real-time. Thank you for your loyalty to Tee Times USA and we hope to continue to earn your business. Tee Times USA’s team of 20 offers you more than 160 years of combined experience in custom golf vacations. Many of our staff have worked at Tee Times USA more than 10 years -- some as long as 16 and even 22 years. We enjoy working as a team in our ocean front headquarters in beautiful Flagler Beach, Fla.
Our staff takes great pride in handling all the key details associated with your dream golf vacation. Whether meeting your budget, matching a group of golf courses to the players ability level, highlighting promotions and specials available, our staff aims to please. While we’re arranging your golf vacations, there are surfers, dolphins and even whales outside our windows. We truly enjoy our work and the Florida lifestyle while we do all we can to ensure your golf vacation exceeds your expectations. What happens if my accommodations or golf courses are not available? What if one of the members in my group can't make it? Can each member of my group pay for his own package? What is an upgrade charge? When do I need to send the deposit? If I book more than one vacation home, will they be next door to each other? 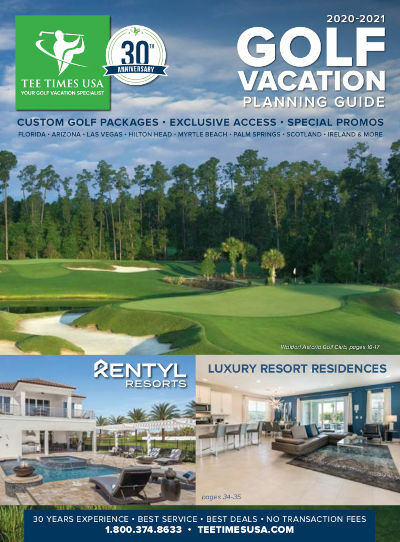 Tee Times USA provides an absolutely free advanced tee time booking service for more than 300 Florida golf courses. We also package together great deals on golf rounds and lodging options to create the best-priced custom golf packages in Florida. We offer hundreds of hotels, condominiums and resorts in every part of Florida. You can use our service to book a tee time or arrange a complete package that can also include a rental car if you choose. Once you book a tee time or a package, we get right to work securing your reservations. Because we can book so far in advance, your requests are usually available and able to be secured. If for any reason your requested golf course or accommodations is not available, you will be contacted promptly by your personal Tee Times USA golf vacation specialist. He or she will offer suggestions for a comparable option and work with you until you are satisfied. If you choose not to proceed with the reservation because your first choice was not available, this would be fine and there are no cancellation charges in this case. Tee Times USA's cancellation policy is probably the most liberal in the travel business. Packages can be canceled up to five days prior to the planned date of arrival with just a $50 processing fee per person. When you are reducing the number of people traveling on a package, rather than cancelling the entire package -- we don't apply the $50 fee at all. There are some exceptions to this policy that usually apply to private home rentals, resorts or condos -- as some do have a more strict policy (such as no cancellation within 30 days prior to arrival). Please check with your personal golf vacation specialist for the exact policy of your lodging choice. It is also very important to keep in mind that if you reduce the number of people sharing a home, condominium or hotel room -- the package rate for the other travelers sharing the room will go up because the cost of the room will be divided by a smaller number of travelers if one cancels! Rainouts are fully reimbursed. Simply call the golf course or our offices well before play is scheduled if the weather seems less than ideal on your day of play. If your round is officially declared a rainout by the pro shop and you have complied with the rain-out policy stated on your voucher, you will be reimbursed in full. Please note, there are very few golf courses that do not comply with our policy of full reimbursement. If you have chosen a golf course that takes exception to our rule, this will be clearly stated on your voucher. Yes. Once the group leader books the package, each member of the group can visit the group's personal, password-protected microsite to pay for their own package. The group leader will have his own password where he can view who has payed and all details on the trip including the status of tee time bookings. Those who prefer to call us can do so at 1-800-374-8633 to provide their credit card information. Stage I: This stage is sent to you shortly after you reserve your package. It confirms that your hotel choice is available and that your package is being processed. At this time, you also receive a hotel brochure, golf course score cards and directions. Stage II: This stage is sent to you when your tee times are confirmed. It is an opportunity for you to review your itinerary and to make sure that everything is exactly as you expected. Stage III: This stage is sent to you approximately 14 days before arrival. It contains the vouchers you will present at the hotels, golf courses, rental car counter, etc..
To ensure that you get the best possible rate on your golf package, we've developed the upgrade system. Upgrades are used to build the price of your golf package (they are not for tee-time-only bookings). Since golf rates vary greatly by golf course, time of day, day of the week and season, the upgrade system allows you to customize your package price by choosing varying times and days for play in order to save money. Your per-person, per night golf package rate already includes a base rate for golf. When you choose your golf courses, the appropriate upgrades will be added to your package rate. Why pay for the most expensive, premium days and times if you're flexible and prefer to save money by playing when the upgrades are lower? You can book your tee time or golf package up to a year in advance. The $50 deposit on golf packages is due upon booking. In many cases, yes -- but not always. When the homes are booked, we can almost always let you know if the homes are next to each other , on the same street, or simply near each other in the same sub-division. Your Tee Times USA representative will work closely with you to make sure you know every detail about the homes you are renting. If the home location cannot be guaranteed, you will be made aware of the subdivision as well as the category of home. The reservation will not proceed unless you are completely satisfied with the information you have.